The BPO (Business Process Outsourcing) industry has provided thousands of jobs to millions of Filipino job seekers since it first came to the Philippines in 1999. The industry is estimated to hit revenues of up to $25 billion by 2016, and may soon account for approximately 10 percent of the nation’s gross domestic product. The Philippines has long been considered as the location of choice of international companies looking to establish their offshore call center facilities due to its less expensive operational and labor costs, highly skilled workforce, proficiency in American-style English and idioms, and a constant stream of college-educated graduates entering the workforce. Top BPO companies such as Hinduja Global Solutions, Teleperformance, and VXI have agreed to partner with jobsDB Philippines for the event. Hundreds of job seekers are expected to flock to the Elbow Room in Metrowalk Entertainment Complex, Ortigas Center to be interviewed, get hired, and celebrate their success with a grand party hosted by former PBB: Celebrity Edition housemate and ace DJ, Rico Robles right after. Pre-registration and pre-screening is ongoing and interested applicants can go to http://hired.jobsdbevents.com.ph/ to register. 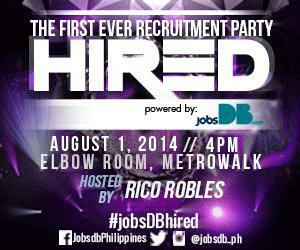 HIRED – the jobsDB Philippines Recruitment Party is made possible with support from the following partners: Unison, Gatsby, Adobo Magazine, Guestlist.ph, wheninmanila.com, Philippine Blogger Network, Solar Entertainment, ETC and Zalora. jobsDB Philippines is the country’s preferred online job portal with substantial positions across Asia that provides job seekers the best opportunities in great companies while delivering exceptional value to employers. For online job posting needs, job fair schedules and other concerns, contact jobsDB Philippines.